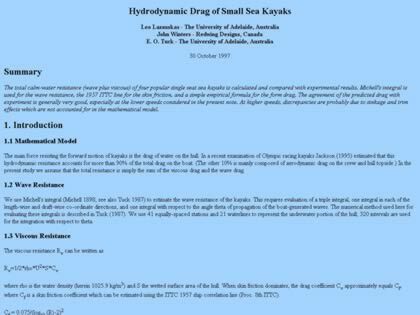 The total calm-water resistance (wave plus viscous) of four popular single seat sea kayaks is calculated and compared with experimental results. Michell's integral is used for the wave resistance, the 1957 ITTC line for the skin friction, and a simple empirical formula for the form drag. The agreement of the predicted drag with experiment is generally very good, especially at the lower speeds considered in the present note. At higher speeds, discrepancies are probably due to sinkage and trim effects. Leo Lazauskas, John Winters, and E. O. Tuck. Web Site Snapshot: If available, above is a snapshot of the Hydrodynamic Drag of Small Sea Kayaks web site at http://www.cyberiad.net/library/kayaks/skmag/skmag.htm as it appeared when this site was added to the directory or last verified. Please Note that Boat Design Net has no involvement with the above web site; all content and images depicted in the above thumbnail are the property and copyright of Hydrodynamic Drag of Small Sea Kayaks unless otherwise noted on that site. Description: The total calm-water resistance (wave plus viscous) of four popular single seat sea kayaks is calculated and compared with experimental results. Michell's integral is used for the wave resistance, the 1957 ITTC line for the skin friction, and a simple empirical formula for the form drag. The agreement of the predicted drag with experiment is generally very good, especially at the lower speeds considered in the present note. At higher speeds, discrepancies are probably due to sinkage and trim effects. Leo Lazauskas, John Winters, and E. O. Tuck.